The French Optics Society (SFO) has announced the winners of its biennial Grand Prix SFO Léon Brillouin. Professor Michel Orrit from the Leiden Institute of Physics (LION) is one of two people that receive the honour this year. The prize was established to honor the memory of physicist Léon Brillouin (1889-1969), whose various works have profoundly influenced the development of optics. The Grand Prix is awarded every odd year, after a jury has selected the winners. 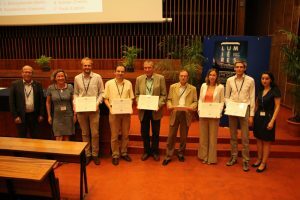 Tagged Award, Brillouin, Orrit, Prix.